SSP manufactures stainless steel tube fittings, pipe fittings, valves for instrumentation, utility, control and process applications. SSP products meet all industry standards and can significantly improve the time and cost of installing, operating and maintaining systems. Our goal is to be the installer’s supplier of choice. To learn more about SSP products, click on the links below. To find product ordering numbers for your application, click here. SSP manufactures high quality tube fittings, pipe fittings, weld fittings and hose fittings in stainless steel, brass, alloy 400 and other material in sizes from 1/16 to 2 in. SSP manufactures high quality ball valves, check valves, needle valves, metering valves, and plug valves. We also make purge and bleed valves and toggle valves. SSP provides straight tubing in sizes from 1/8 to 1 in. (3 to 25 mm), in wall thicknesses from 0.028 to 0.134 in. (1 to 2.5 mm) and coiled tubing from 1/4 to 1 in. with wall thickness from .035 to 0.134. SSP provides customers with a wide range to tools to build leak-tight tubing and pipe systems. 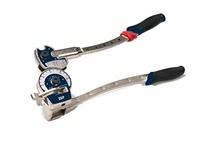 Tools include: tube benders, tube cutters, deburring too, preset tools, liquid leak detector and more. 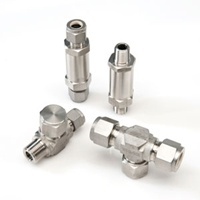 Quick Connects SSP offer DESO, SESO and full flow quick connects in brass and stainless steel. SSP manufacture inline and tee-type particle filters for both air and liquid services. FloLok filters are available in brass and stainless steel and with filter/strainer element from 1 to 400 microns. 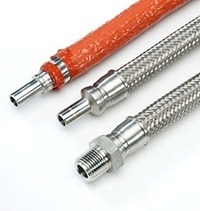 SSP offers flexible metal and PTFE core hose with a variety of end connections up to 2 in. 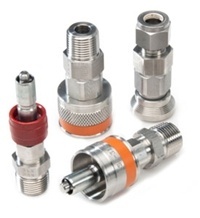 We also offer a wide range of hose fittings for hydraulic, teflon, push-on and other hose types.